CZAZ-SZ is a freely programmably device. Three independent sets of protection algorithms (bus-system 1, bus-system 2, sum) constantly monitor balance of incoming and otugoing currents in substation. Each of algorithm consist current and phase-comparision element. Operate signal is generated by AND „two of two” logic. That means, that both of algoritms („bus” and „sum”) must be simultanously activated in order to generate the trip signal. In some cases when the bus coupler bay is unequipped with CT, the sequential operation mode could be applied. I.e. when „sum” algoritm operates, the bus coupler CB open first. Next CB which has to be opened is selected by bus algorythms of section 1 and 2. In case of detection 5% deviation in current inputs, the device operation is blocked after 5 sec delay. Currents unbalanced condition when current values are not significantly higher than the rated values should be interpreted as improper connection of the device with substation secondary circuits. The device shows occurance of failure by set of RGD LED diodes and 7” LCD screen. All signals can be grouped to one ALARM or Failure signal. 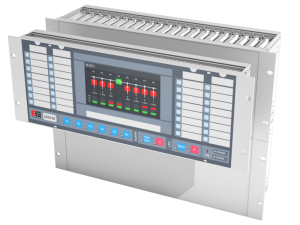 7” LCD touchscreen allows to monitor switchgear breakers, settings change, preview of inputs and outputs statuses, language change, preview of time, event recorder or measured values. Busbar differential protection relay of type CZAZ-SZ provides protection of single busbar, sectionable HV and extra-HV switchgears. The relay can be used in switchgears of H4 or H5 connection arrangement and control up to 8-breakers.. Short circuits occuring within the protected busbars are selectivelly cleared respectively to the switchgears section. CZAZ-SZ protects against the results of faults the following substation equipment busbars, disconnectors and circuit breakers. The relay provides also the function of CB-failure protection and trip circuits supervision function. Annunciation of failure condition provides the substation staff precise and quick information about present situation. The device is equipped also with the event recorder and disturbance recorder. Recorded data can be transferred to supervision system by fiber-optic channels, RS-485 channel or Ethernet. Communication protocol can be chosen by software. Available protocols: ZEG, IEC 60870-5-103 and (optionally) MODBUS, DNP-3, IEC 61850.